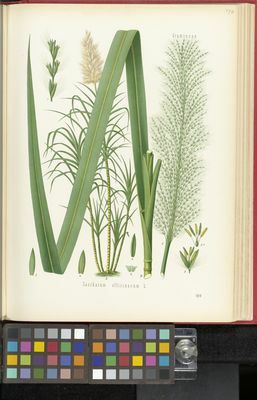 Saccharum officinarum is a member of the grass family (Poaceae) and is widely cultivated, providing around 70% of the world's sugar. 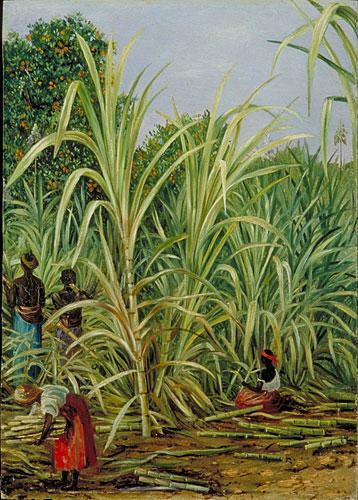 Sugar cane yields the highest number of calories per unit area of cultivation of any plant. Sugar is extracted from the sweet, juicy stems of sugar cane, and is used worldwide as a sweetener, preservative and in the cosmetics industry. Sugar cane probably originated in New Guinea, and was taken to the Americas by the explorer Christopher Columbus on his second expedition there in 1493. 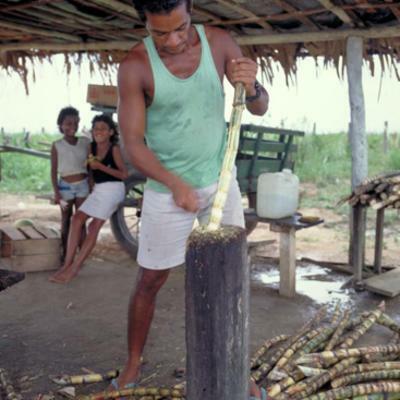 Sugar cane is now grown in more than 70 countries, mainly in the tropics, but also in some sub-tropical areas. India and Brazil produce about half the world's cane sugar. The word 'sugar' is thought to derive from the ancient Sanskrit 'sharkara'. Sugar cane is grown in southwestern Europe, Africa, temperate Asia, tropical Asia, Australia, the Pacific, southeastern USA, Mexico, and South America. It has been cultivated in New Guinea since about 6000 BC, and, from about 1000 BC, it was gradually spread along human migration routes to Asia and the Indian subcontinent. Overview: A tall grass, which looks rather like a bamboo cane, and grows 3-6 m high with culms (stems) 20-45 mm in diameter. The thicker-stemmed forms are commonly known as 'thick' or 'noble' canes because of their tall, handsome, colourful stems. Leaves: Broad (up to 6 cm wide), 70-150 cm long, borne alternately on the stem, with leaf base encircling the stem. Fruits: An oblong caryopsis (small, dry, one-seeded fruit), 1.5 mm long. 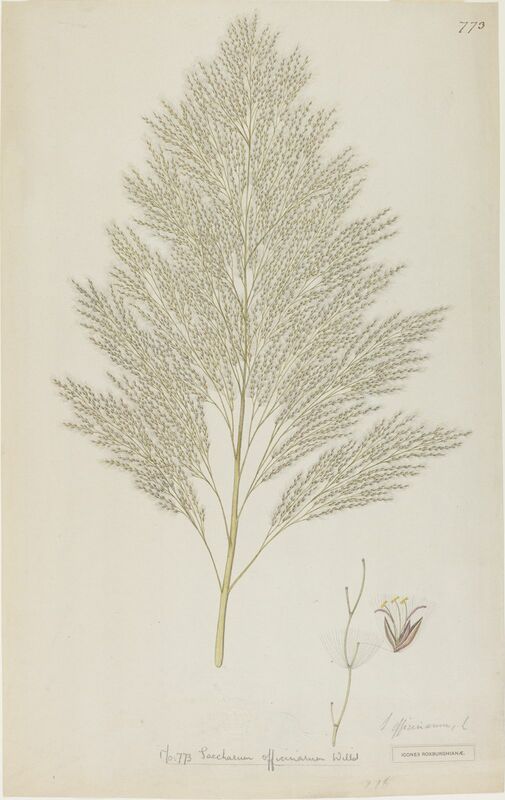 Saccharum officinarum can be recognised by its hairless or short-haired panicle axis, and leaf-blades up to 6 cm wide. 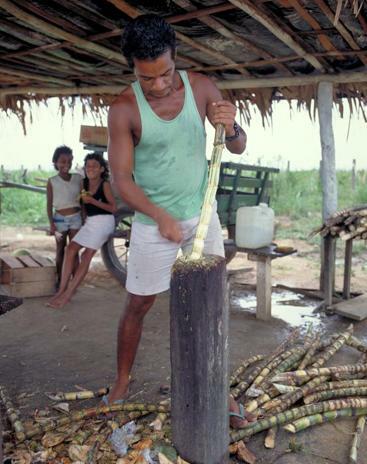 Sugar cane was originally grown in southeastern Asia and the Pacific for the sole purpose of chewing. The rind was removed and the internal tissues sucked or chewed. The production of sugar by boiling cane juice first took place in India, most likely during the first millennium BC. Sugar is now a highly valued food and sweetener and also serves as an edible preservative. Raw and refined sugars are produced by heating, removing impurities and crystallising sugar cane juice, which mainly consists of sucrose. Raw and refined sugars are exported all over the world for use in sweet and savoury dishes, processed foods and drinks and for preserving fruits and meat. They are also compressed into sugar cubes and made into syrup. White sugar can be further processed (ground into a fine powder) into icing sugar, which is used in desserts, baking and confectionery. In India, the young shoots of sugar cane are sometimes steamed and roasted as a vegetable. 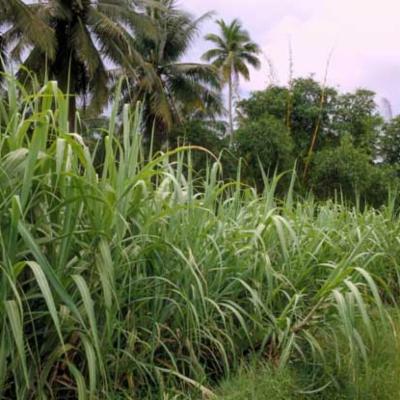 Sugar cane has also been used medicinally. In southern Asia it has been used to treat a wide variety of health complaints from constipation to coughs, and has been used externally to treat skin problems. Both the roots and stems are used in Ayurvedic medicine to treat skin and urinary tract infections, as well as for bronchitis, heart conditions, loss of milk production, cough, anaemia, and constipation. Some texts advise its use for jaundice and low blood pressure. Sugar paste has been widely used to pack wounds and aid healing. Sugar is used for hair removal, in a practice that is thought to date back to the ancient Egyptians. A warm paste of sugar, water and lemon juice is applied to the skin. Strips of cloth are then pressed over the paste and torn off quickly, taking the hair with them. 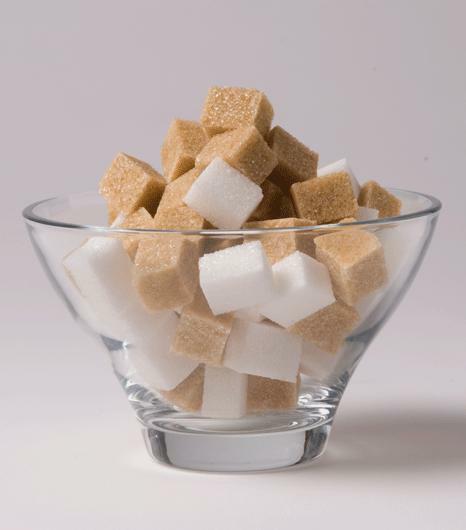 Sugar is also used in soap-making and as an abrasive scrub to exfoliate skin. A by-product of sugar refining is molasses, which is a dark, syrupy product used in the preparation of edible syrups and for numerous industrial products. It is used for animal feed, fertilizers, and even for adding to tobacco for hookah pipes and some cigarettes. 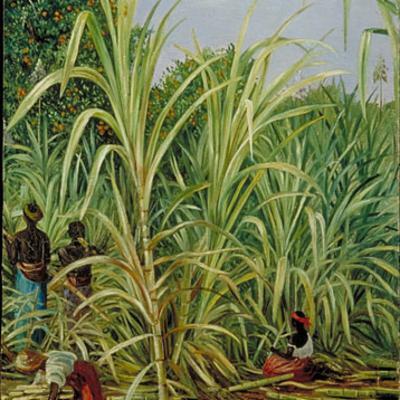 Molasses, along with cane juice and other by-products of sugar production, can be fermented and then distilled, to produce rum. Pure alcohol (ethanol) can also be produced from molasses, and is used in the preparation of vinegar, cosmetics, pharmaceuticals, cleaning preparations, solvents, and coatings. Ethanol produced in this way (bioethanol) is widely used in Brazil and the USA as a motor fuel, as part of a movement to use sustainable alternatives to petrol. Other products produced from molasses include butanol and lactic acid (solvents), citric acid (used in foods and drinks), and glycerol. The fibrous cane residue left after processing is known as bagasse and is used as fuel to generate energy for the sugar manufacturing process. It also serves as a fibre for making paper. The fibre is separated from the pith, which itself can be used as an animal feed. Filter cake, consisting of cane juice, impurities and lime, is used as a soil improver. 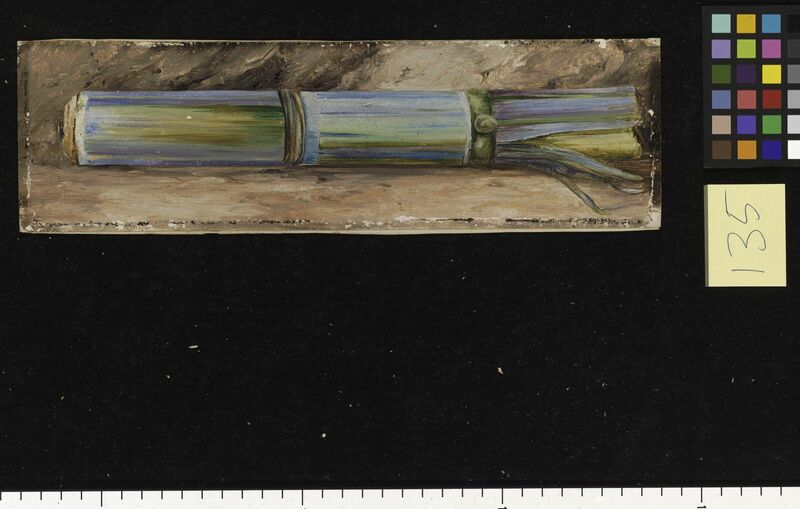 Sugar cane is successfully propagated in Kew's Tropical Nursery using cuttings taken from the cane and then laid flat. The plants require large pots due to their extensive root system. 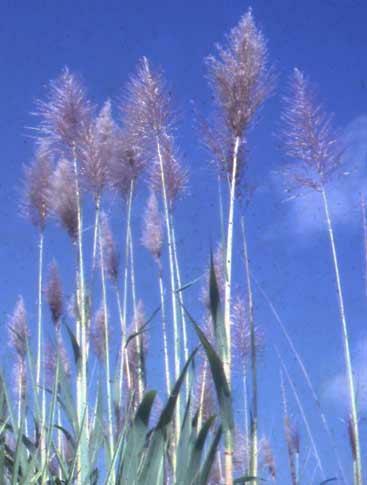 Sugar cane benefits from regular feeding and a large volume of compost. A standard Kew mix containing 10% loam, 45% coir and 45% Silvafibre with added fertiliser is used, and is kept moist. The glasshouse zone in which sugar cane is grown has a minimum temperature of 14˚C and high light intensity. Under good light conditions the plants grow strongly and do not require staking. 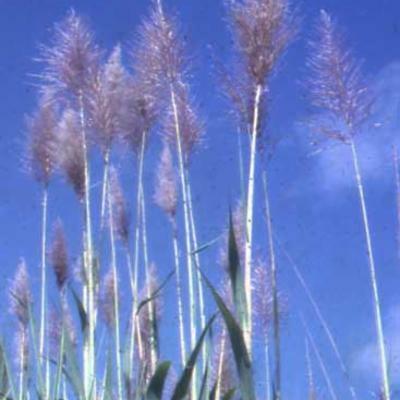 Sugar cane can suffer from red spider mite infestations, which can cause considerable damage to leaves. Saccharum officinarum is on display in Kew's Palm House, where many tropical economic plants can be seen. Pressed and dried specimens of sugar cane are held in Kew's Herbarium, where they are available to researchers by appointment. Details of one of these specimens can be seen online in Kew's Herbarium Catalogue. Kew's Economic Botany Collection is home to over 30 specimens of sugar cane and related products. These include sugar, syrup, wax, molasses and even toilet paper made from S. officinarum . Hot humid tropics, in moist soils. Not evaluated according to IUCN Red List criteria; widespread in cultivation. 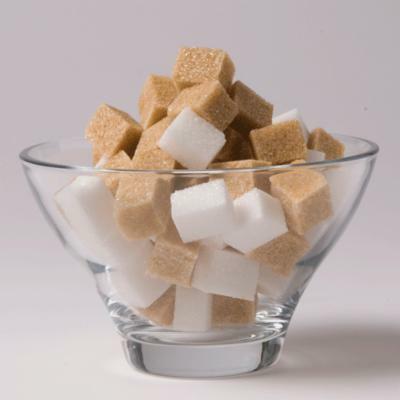 Sugar consumption can be a factor in tooth decay and obesity. Perennial; caespitose. Rhizomes absent. Culms erect; robust; 300-600 cm long; 20-45 mm diam. Culm-internodes solid; yellow, or mid-green, or purple; distally pruinose (below nodes). Leaf-sheaths loose. Ligule a ciliolate membrane. Leaf-blades linear, or lanceolate; 70-150 cm long; 30-60 mm wide; glaucous. Leaf-blade midrib conspicuous. Leaf-blade surface scaberulous; rough adaxially. Leaf-blade margins scaberulous. Leaf-blade apex acuminate. Inflorescence a panicle with branches tipped by a raceme. Peduncle glabrous, or pubescent above. 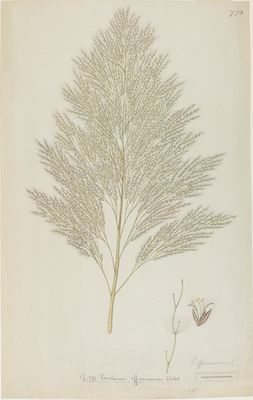 Panicle open; pyramidal; dense; 40-60 cm long. Primary panicle branches whorled at most nodes; 5-10 cm long. Panicle axis glabrous, or puberulous. Panicle branches glabrous, or puberulous; bearded in axils. Racemes 5-10 cm long. Rhachis fragile at the nodes; subterete; glabrous on margins, or ciliate on margins. Rhachis internodes filiform; 4-7 mm long. Spikelets in pairs. Fertile spikelets sessile and pedicelled; 2 in the cluster; subequal. Pedicels filiform; glabrous, or ciliate. Spikelets comprising 1 basal sterile florets; 1 fertile florets; without rhachilla extension. Spikelets lanceolate; dorsally compressed; 3.5-4 mm long; falling entire; deciduous from the base, or with accessory branch structures. Spikelet callus bearded; base truncate. Spikelet callus hairs white; 7-12 mm long; 2-3 length of spikelet. Glumes similar; firmer than fertile lemma. Lower glume lanceolate; 1 length of spikelet; membranous; much thinner above; 2-keeled; 4 -veined. Lower glume surface flat. Lower glume apex acute. Upper glume lanceolate; 1 length of spikelet; membranous; much thinner above; without keels; 3 -veined. Upper glume margins eciliate, or ciliolate. Upper glume apex acute. Basal sterile florets barren; without significant palea. 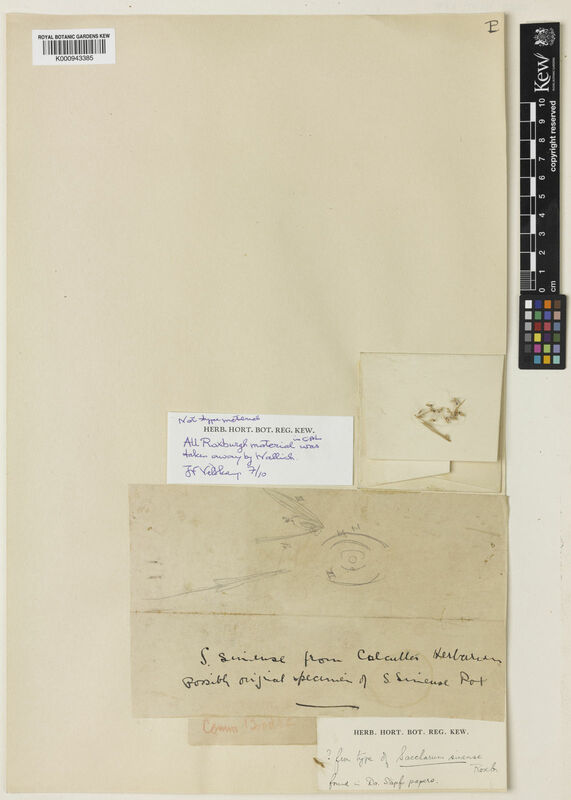 Lemma of lower sterile floret lanceolate; 1 length of spikelet; hyaline; 0 -veined; without midvein; without lateral veins; ciliate on margins; acute. Fertile lemma present, or absent; linear; 0-1 mm long; hyaline; 0 -veined. Palea absent or minute. Lodicules 2; cuneate; glabrous. Anthers 3; 1.5 mm long. Caryopsis with adherent pericarp; oblong; isodiametric; 1.5 mm long. Embryo 0.15 length of caryopsis. Europe: southwestern. Africa: north, Macaronesia, west tropical, west-central tropical, northeast tropical, east tropical, southern tropical, south, and western Indian ocean. Asia-temperate: western Asia, Arabia, China, and eastern Asia. Asia-tropical: India, Indo-China, Malesia, and Papuasia. Australasia: Australia. Pacific: southwestern, south-central, northwestern, and north-central. North America: southeast USA and Mexico. South America: Mesoamericana, Caribbean, northern South America, western South America, Brazil, and southern South America. Culms up to 6 m. high. Cultivada en Colombia; Alt. 0 - 2500 m.; Amazonia, Andes, Guayana y Serranía de La Macarena, Islas Caribeñas, Llanura del Caribe, Orinoquia, Pacífico, Sierra Nevada de Santa Marta, Valle del Cauca, Valle del Magdalena. Food and drink, medicine, alcohol production, biofuel, hair removal. Used for basketry (Linares et al. 2008). Leaves - The leaves are used to make hats (Linares 1994). Saccharum officinarum var. brevipedicellatum Hack. Caña de azúcar, caña costeña. Clayton, W.D., Harman, K.T. & Williamson, H. (2006 onwards). GrassBase - The Online World Grass Flora. Stevenson, G.C. (1965). 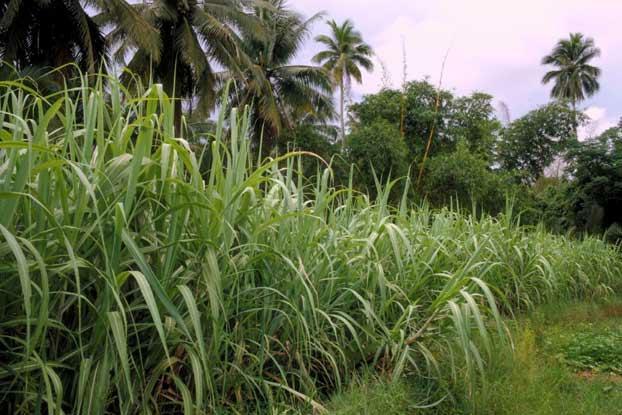 Genetics and Breeding of Sugar Cane. Longmans, London. Artschwager & Brandes in U.S. Dept. Agric., Handbook 122 (1958). L., Sp. Pl. : 54 (1753).